In Norse mythology, Ragnarök ("fate of the gods") is the battle at the end of the world. 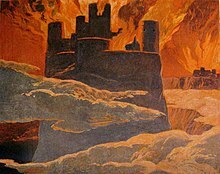 It is to be fought between the gods or Æsir, led by Odin; and the fire giants, the Jötnar and other monsters, led by Loki and Surtr. Not only will most of the gods, giants, and monsters die in this battle, but almost everything in the universe will be destroyed. Odin vs Fenrir: Odin will be swallowed by Fenrir. Vidar vs Fenrir: Vidar will kill Fenrir by stepping on the jaw of Fenrir and split it with his bare hands. Other gods who will die in Ragnarok are: Bragi, Ve, Hel, Brunhilde, the valkyrie and Meili, Thor's brother. Njord will not fight, but he will die when Surtr sets Vanaheim on fire. Surtr will use his sword to cover the world in flame. But he too shall die in the fire. Not many gods will survive Ragnarok. The known survivors are: Aegir, Vidar, Vali, Hoenir, Vili, Magni, Modi, Hermóðr, Forseti and Ullr. Though most of the goddesses survive, (Frigg, Freya, Sif, Thrud, Idun, Saga, Eir, Gefjun, Fulla, Sjofn, Lofn, Var, Vor, Syn and Hlin) Snotra, Gna, and Nanna die. ↑ Snorri Sturluson in his Prose Edda spelled it Ragnarøkr (sometimes "Ragnarøkkr") which means "Twilight of the Gods," whence the German title of Wagner's work "Götterdämmerung." This page was last changed on 10 April 2019, at 01:52.